Hi! My name is Nicholas. 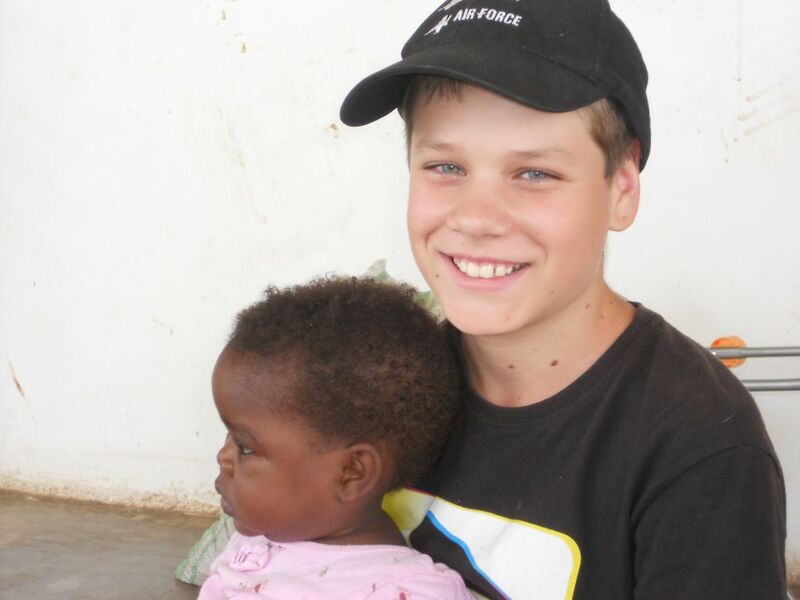 I am 12 years old and I live in Australia but I am on my way to Africa!! My uncle drove us to the airport and we hopped out of the car and grabbed our suit cases and walked into the building. Team Australia consisted of me, Aunty Narelle and Dad. After 12 hours of flying we touched down on the ground in South Africa and got off the plane. It was a long trip and now I was suffering from jet lag. It was the first time I had ever experienced it. Me and dad woke up and walked around to see Banana village, when I casually mentioned how cool it would be to see some monkeys. Trusting my luck we walked outside and looked around and a monkey tried to kill us… literally it started dropping random bits of rotten fruit down to hit us on the head. Luckily no one was hurt. What a fun welcome to Uganda! One thing I forgot to mention was that the Greg and Patti Kerr arrived last night so now we were a proper team united from different continents. We were together. The team was as follows: Team America: Greg, Frank, Patti and Cara (Cara lives in Uganda but is born in America so its hard to categorize her!) Team Australia: Nicholas, Andrew and Narelle and finally Team Uganda: Seggy and every other person here! We all sat down, ordered and 4 hours later we got our last meal. At least we got to know everyone better. We had taken a young man for dinner named Alfred and he didn’t seem to mind that the food had taken so long. In fact we might still be waiting for my drink! The next day we headed out to Alfred’s parents house where we saw the borehole (well) that Remember the Poor had donated. After a short visit we prayed for them and got back into the car. We then drove for a long time to a school where we were greeted by song and dance. We then left after talking to everyone. On the way back Pastor Experito’s tire deflated and we had to leave him. The next day we went back to the school again. We all split up into two groups and left for three houses each. Unfortunately at our first house no one was there so that took it down to two, but everything else was awesome such as when we reached the first house we went inside their hut and I prayed and talked to them. (Using a translator) I said “I wish I lived here… you have way better houses than what we have in Australia… we have these massive houses that we don’t need.” The reply was “from now on you live here” and lots of laughs.“ Dad then said that my Mum would be sad if I stayed here! The second house I found puppies and I played with them. They asked my dad whether or not I wanted to keep one… my dad’s reply was that we already had a dog… anyway how would we get it back to Australia? We left Gulu that day… I had decided that someday I was going back. We keep going all over the place, which is fine with me! And now we are going to Katakwi from Banana Village, but on the way there we are stopping at Seggy’s parents house for lunch, there I eat a feast with my hands… it was sooooooooooooooooo good. I got out the rocket balloons and I brought kids from all over to watch. It was awesome! One the way to Katakwi, God put on a “Fire works” display for us (lightning is awesome). We reached the place we were staying but there were not enough rooms for all of us, so Seggy and Cara found more rooms at a nearby motel. Today I woke up remembering that I somehow was meant to find verses for my preaching to the kids in Apelleun… but the light was not working and it was still dark. I waited a bit longer. Then I got out my Bible and found what I wanted to use and Cara and Seggy came over to us for breakfast. We then got into the van rolled the door shut and started driving. We reached the village and we were swarmed by numerous kids. Something was telling me that this was going to be chaos. I was right! When I was speaking, the hundreds of kids lost interest and lots were looking forward to when I would stop talking. My message did not make its way to their ears. The translator was great; the number of kids was not. When we handed out the beads to the children to make bracelets we were swamped. I also used the rocket balloons and the kids went psycho over it. They loved it… I loved it! We then left Katakwi for Jinja so we sat down in the car and drove for a long time when we finally reached Jinja. We went to Tonya’s house to stay and we talked for a while and I played with Christopher and Clayton until I had to go to bed. I woke up surrounded by a mosquito net as usual and dropped down from the bunk bed; then I got up and went out to see only a few people up and doing things like me. A while later Tonya had made us all banana bread which was really nice. Dad had also invented nutella and banana which tastes just like a chocolate banana– we had a banana breakie. We then got everyone together and we walked to Renee’s house and were met by lots of little children and mothers. Dad got me to have a photo with a young baby named Sophia. Soon I was cradling her. At lunch time I went out to help feed the five hundred! They consisted of all children. I was handing out the bananas and having a great time. It was really tiring though! 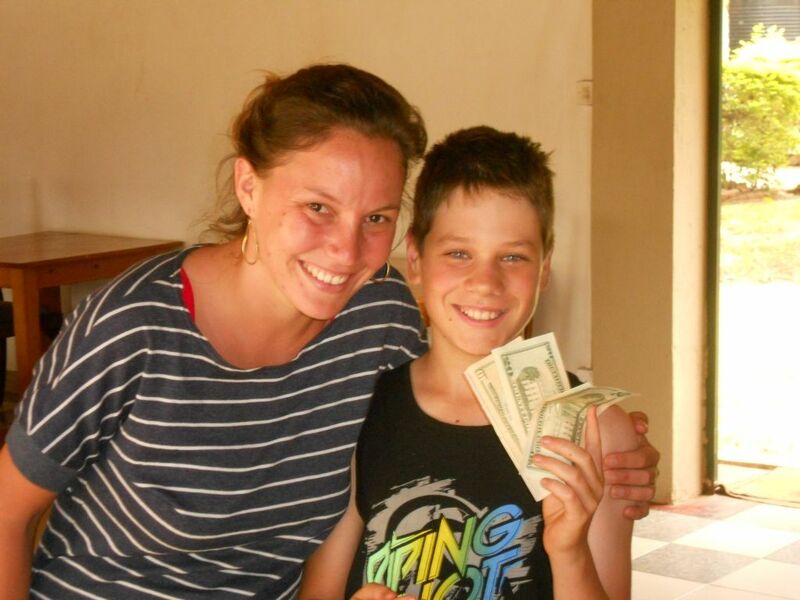 The next day was my last day in Uganda in which I gave one hundred dollars to Cara for a bike and cart for the Alelesi village, and after I took a bodoh bodoh (a taxi like motorcycle) with dad to Cara’s house it was so fun! We walked to the Nkumba School/ church and took two children with us to go to the beach (Lake Victoria). At the beach we had fish and chips which tasted great. I even ate the eye ball. It was the best! I felt really sad that I had to go and I kept on looking at my surrounding area thinking how much I would miss it all, and I promised many people that I would come back. I said goodbye to the people I would not see in the morning and went to bed. I awoke and remembered I was leaving and I was really sad. Frank, Patti and Greg got up early to see the Australians off and then we were driven to the airport by Seggy. So here I am sitting at this computer typing up 2 weeks of information: a really hard job to get information to you. 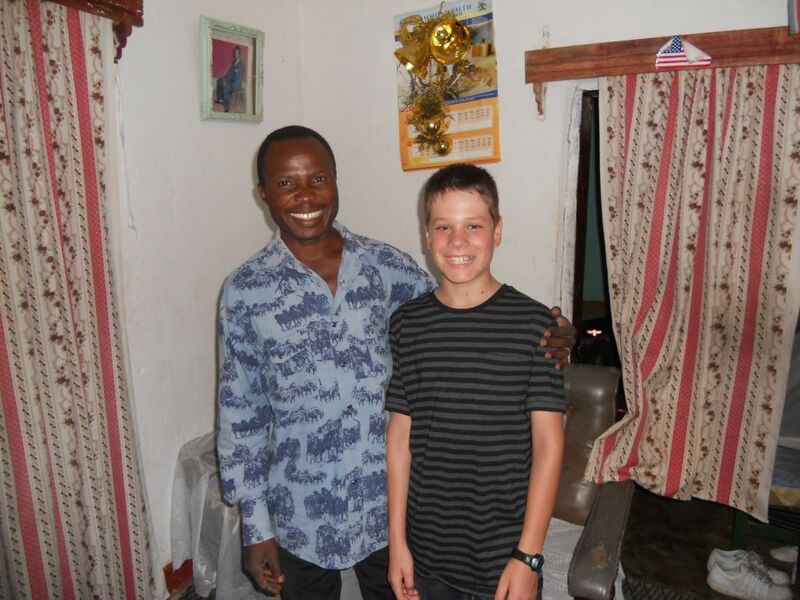 I love Uganda and I need to go back someday… as a missionary!…. someday.